190,000 Muslim women, or 22%, speak little or no English. This is based on census data from 2011. 22% of Muslim women said they speak English "not well" or "not at all". For Muslim men the equivalent figure was 10%. "New figures show that some 190,000 British Muslim women—or 22%—speak little or no English despite many having lived here for decades. 40,000 of these women speak no English at all." The government’s figures seem to be correct for England, at least according to the 2011 census. The alternative 6% figure, from the Muslim Council of Britain, isn’t measuring the same thing. There were around 846,000 Muslim women aged 16 or older living in England as of the 2011 census. Of these, almost exactly 190,000, or 22%, said that they could speak English “not well” (152,000) or “not at all” (38,000). These 190,000 Muslim women are part of the 863,000 people in total who said they couldn’t speak English well or at all that year. 90,000 Muslim men, or 10%, said the same. An alternative figure of 6% rather than 22% was offered by a contributor to the Today programme, citing the Runnymede Trust. When we asked, Runnymede referred us to a report by the Muslim Council of Britain, rather than anything it published itself. At the time this report was published, in January 2015, the analysis the government used today wasn’t available. 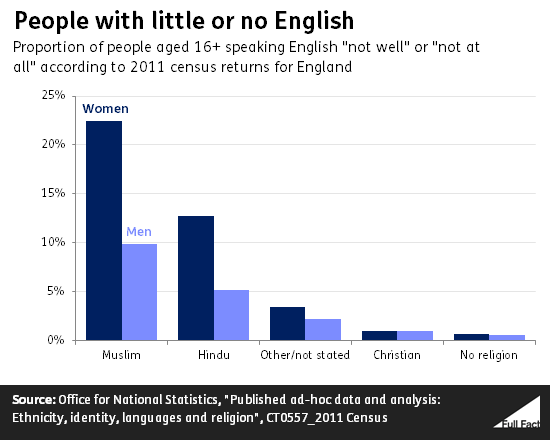 The standard census tables don’t break down English language ability by religion. The Muslim Council of Britain looked instead at people living in England and Wales who were born in Pakistan or Bangladesh. It found that one in four reported speaking English not very well or not at all. The Council compared this with the total Muslim population to get a figure of 6%. It says that those born in Pakistan or Bangladesh group of people represents “those most likely to be Muslim and also most likely to struggle with the English language”. So for the 6% figure to be accurate, we’d have to assume that no Muslim apart from those born in Pakistan or Bangladesh struggles with English. The analysis also isn’t specific to “women”. It’s taking people of both genders, aged three and up. So it doesn’t rebut the government’s claim. We updated our overall "verdict" to make it clear what people responding to the census said about their level of English.